This Montreal Spring was rich in digital arts events. 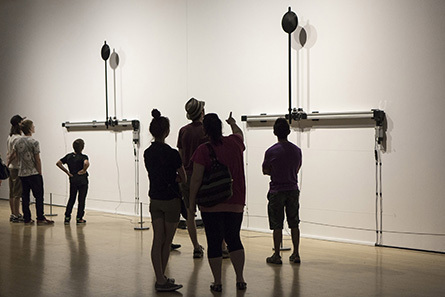 The Museum of Contemporary Art (MAC) welcomed the International Digital Arts Biennial (BIAN), while the Elektra and Mutek Festivals merged under the name EM15 for their fifteenth anniversary. Concurrently, the 7th International Digital Arts Market was held at the Phi Centre. 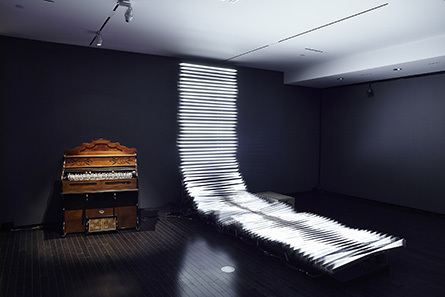 The International Digital Arts Biennial in Montreal, for its second edition, was held primarily at the Museum of Contemporary Art (MAC) of the city. The generative works of Sébastien Lacomblez are right in place in this context since they, through the use of digital technology, raise again the issue of the monochrome in art. Their surfaces made of the outrenoir specific to the French artist Pierre Soulages, are treated with light by the Belgian artist. From a distance, the monochromes of the “Landscape” (2014) series seem to show relief, though when seen close, they turn out to be as smooth as photographs. The title of this series encourages us to see landscapes, night scenes, without being able to give them any scale whatsoever. Each print is unique and the reliefs, when framed, extend but are never repeated. 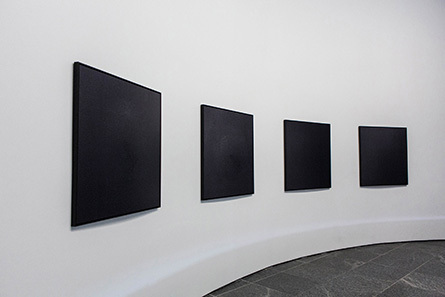 The monochromatic is one of the more radical practices of modern and contemporary art and its reactivation in the era where images are calculated and where the digital is entering museums, appears self evident. The installation “Signal to Noise” (2012) of the LAb[au] group of artists is, like the Landscape series, among the pieces that the Federation Wallonia-Brussels presented at this BIAN 2014. 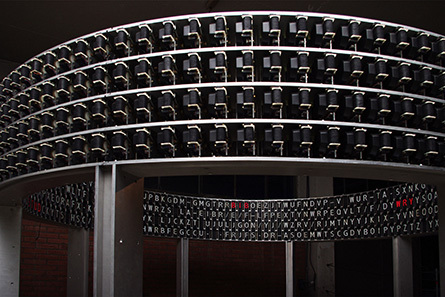 Circular in shape, it consists of a multitude of flip flap displays controlled by the same algorithm. Spectators are invited to enter the installation, which then immerses them in the irregular noise of the characters as they are renewed. In an airport, or more precisely in a station, because it is from there that the displays that compose it derive, the machine can "calculate" all destinations worldwide. But here it is words that appear, randomly, in red. Words spelled out in the din that once assembled make little sense, like the oracles of the Pythia. It is not excluded that a sentence be for a viewer, but what the machine painfully expresses is closer to a form of visual and sound poetry. It is likely that the algorithm around which it was designed is actually slowed by the obsolescence of yesterday's components, which nevertheless give it its sculpturality today. In another room at the MAC are Felix Luque Sanchez' installations. He is of Spanish origin but having lived and worked in Belgium for several years, he also represents the Federation Wallonia-Brussels with a series entitled “Different Ways to Infinity”. One of them, “Clone”s (2013), exemplifies the theme of The New Alliance, which brings together artists from Wallonia-Brussels in Montreal in reference to the essay by Ilya Prigogine and Isabelle Stengers written in 1978. This link is due to the fact that it is a question of science in the context of culture and the work is part of a search for balance. The two large pendulums of the installation, driven by motors, begin in the up position. And that's when the devices attempt for a time to keep the pendulums on high. Recall that the transition from non-equilibrium to equilibrium is discussed in Book 2 of The New Alliance, which deals more generally with the interactions between science and culture. And thus we are participating in the research by machines into uncertain balances, through what has the appearance of a scientific experiment in a museum context. Whereas it is over time, between the non-equilibrium and balance, that they reach the most fragile ideal form. If there is one work that is particularly suited to the overall theme of physical/ité developed again this year by Alain Thibault, it is that of Robyn Moody called “Wave Interference” (2012). This because it gives a relative physicality to the light emitted by the constantly renewed wave of the moving fluorescent tubes that comprise it. And as to respond to this ripple without beginning or end while stretching it further, there is the constant stream of sound of the organ that accompanies it. This wave, which defies gravity then seems suspended in space, in a state of transition that the notes of the organ perpetuate. Extirpated by a mechanism that the Canadian artist has specially designed for this purpose, they intermingle with the fluorescent lines to become one with the wave. The flow of notes stretched in their length adds to the lines of pure light to form a whole that literally captivates the spectators. With contemplation outweighing analysis, comments are rare. Leaving the MAC to get away somewhat from the centre of Montreal and its entertainment district, is to take the risk of making discoveries such as with the solo exhibition of Samuel St Aubin at the Marie-Uguay Cultural Centre entitled “De choses et d'autres”. He is a member of the artist centre Perte de Signal and creates small experiments using devices combining mechanical and electronic components with everyday objects. 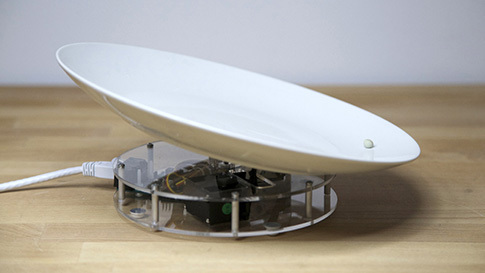 There is, for example, these devices featuring rotating white plates, each of which is equipped with a pea. Poetry, with Samuel St Aubin, is expressed through the mundane. And whenever a pea falls, it is immediately replaced by the Quebec artist who thus only preserves those whose nature provides the most perfect trajectories. This insignificant experiment of the banal repeated by three machines, which are in all ways identical, refers us back to the calibrations that govern our lives; from those of our fruits and vegetables determined by the food industry to those of our feelings through social media. It is a world where everything is supposed to go in boxes except, perhaps, in art where it is still possible to lose time in the making as in the observation of utterly useless machines, which are thus resolutely poetic. The BIAN of Montreal emerged from the Elektra Festival, which this year merged with Mutek. 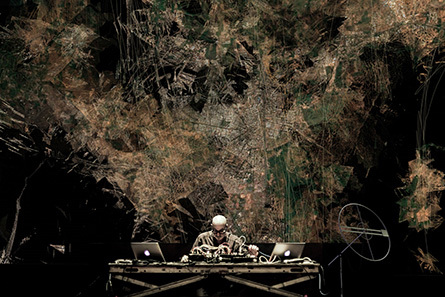 The two events, respectively designed by Alain Thibault and Alain Mongeau, are celebrating their 15 years of involvement in the field of digital arts and electronic music. 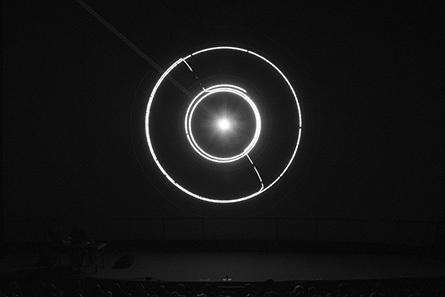 The result of this anniversary fusion gave the name of EM15 and it is in this context that Herman Kolgen gave his audio-visual performance called “Seismik” (2014) on the centre of the stage of the Imperial Cinema where he had previously set up a sensor system. He only partially controls his performance through an online application that scans the seismic tremors of the earth's crust in some of the places where these occur. These are therefore data collected in real-time that control the edit points as they do the positions of the virtual cameras. The movements of magma in the depths of the earth thus affect the surface travel that the Quebec artist offers us. But it is also disturbed by the magnetic responses that are given locally by the small square of earth beneath the room that is affected in turn by the Seismik performance. Also in the picture as in the sound, noise of the most diverse forms predominates. 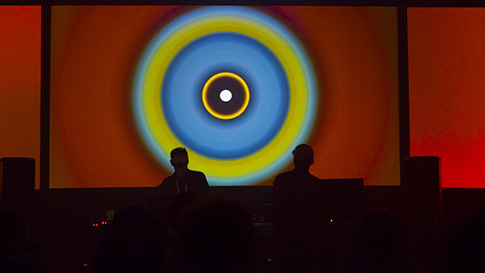 On another evening, it was Robert Henke who caught viewer attention at the Imperial Cinema. Upon the initiative of the Monolak project, this German electronic music composer uses three high-power lasers when giving his “Lumière” (2013) performance. The strokes he draws are inseparable from the electronic sounds he generates with the same commands. The radical quality of their forms evokes the beginnings of computer graphics where one thinks, when they become more complex, of artists like Ben Laposky, who made use of oscilloscopes beginning in the fifties. We must recognize that the laser has something mesmerizing about it, in its power and in its purity, but the show is also perfect in its writing. It is comparable in terms of quality to the research of the Australian artist Robin Fox. And the Barbican Centre, which is one of the art centres in the world open to emerging practices is not mistaken in planning to bring these two artists together very soon on the same evening. Lastly, it is in the company of the American artist Matthew Biederman that Alain Thibault, already busy in the day organizing the International Marketplace for Digital Arts (IMDA) which has been bringing together Quebec artists, researchers, producers, international curators and critics for some years now, gave the performance “Physical” (2013) at the MAC. Not satisfied with having introduced digital artistic practices within an institution of contemporary art, he launches into a powerful set coloured by references to German industrial music. Tirelessly, he repeats "I wanna get physical" in a voice treated with a vocoder whose sound is inseparable from the experiments of Kraftwerk and more recently appropriated by Daft Punk. Meanwhile, Matthew Biederman re-injects an aesthetic ranging from pop to minimal on the screen of the MAC with a lot of rasters and essentially saturated colours arranged in concentric circles, much like the Kenneth Noland artworks exhibited last year in this same museum. Well beyond the fusion of two festivals, what just happened in Montreal is symbolically important because it is high time that the digital practices of contemporary art are included in major museums. We are therefore eagerly awaiting the first International Biennial of Digital Art of Paris, as part of the continuity of the Nemo Arcadi Festival artistically directed by Gilles Alvarez, which will be held on uneven years beginning in 2015. And it's a safe bet that these events will multiply until digital contemporary art is more widely accepted in Venice, Sao Paulo and Sydney. Written by Dominique Moulon for Art Press and translated by Geoffrey Finch, June 2014.